There’s a lot of information out there, some of it conflicting. What makes things more difficult is that different so-called ‘experts’ have quite different things to say; so… on balance, these are the considered opinions of this writer after a lot of reading and talking to doctors and people in the health and nutrition business. (Brand names are used to promote understanding and illustrative only). Which fat is best for frying? ﻿Don’t use the typically large bottles of cheap vegetable and seed oil such as sunflower and corn oil. They contain a high proportion of Omega-6 fatty acids of which most of us already get too much in our diets and some of the commercial processing methods are questionable. The ‘least bad’ of these big bottle solutions is probably rapeseed oil, sometimes marketed as colza, though remember that it is highly processed, purified and bleached before it passes through a de-odoriser to take away the 'cabbagy' smell, although admittedly, it is richer in Omega-3. These seed oils also emit unhealthy elements into the air where you are cooking when heated so... be careful with them. Martin Grootveld, professor of bio-analytical chemistry and chemical pathology at De Montfort University, was asked in 2015 to investigate the "healthiest" oils to cook with for the BBC series Trust Me I'm a Doctor. 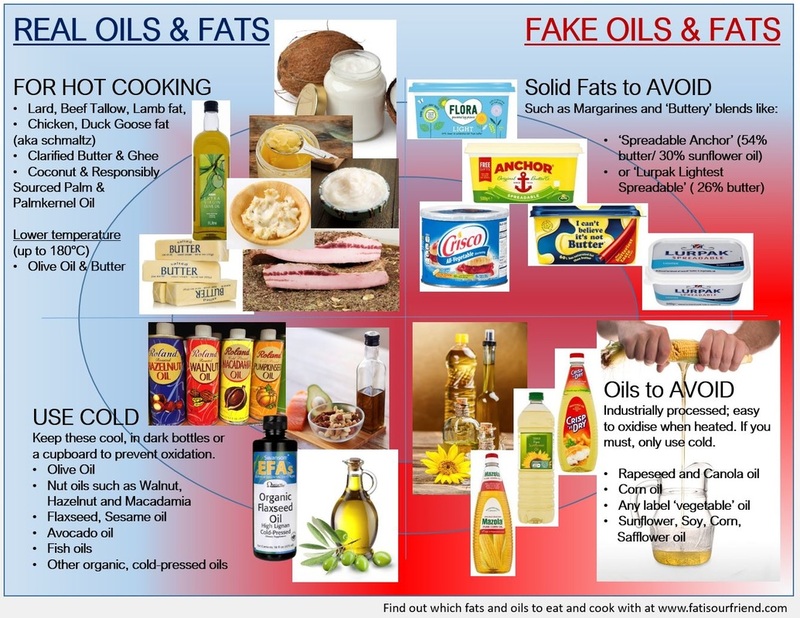 We know that when fats and oils are heated the molecular structure changes, producing chemicals called aldehydes that have been linked to heart disease and cancer even in small quantities. But what his team discovered surprised even him. They found that sunflower oil and corn oil produced aldehydes (which are toxic compounds) at levels 20 times higher than recommended by the World Health Organisation. Fryers beware! Saturated fats are good for you so it’s quite OK (even beneficial to your health) to use beef dripping, butter, coconut oil and goose fat! ... Especially coconut oil, sometimes labelled as coconut butter, is heart-healthy It doesn’t go easily rancid and has a high smoke point, so it’s great for frying. Some people say it has too much taste but in it’s mostly the distictive smell which reminds you of its origins. The cheaper olive oils have a relatively high smoke point but they go rancid more quickly than the above-mentioned fats and oils so keep in a cool dark place. Extra virgin is better kept for salads. Ghee - make your own clarified butter to allow for higher cooking temperatures and store it, for months if needed, in your fridge; Ghee is both delicious & nutritious. 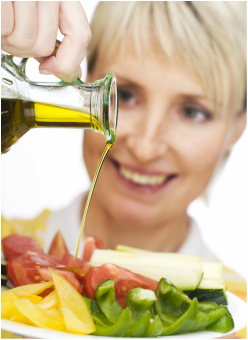 ​Olive oil is a relatively stable mono-unsaturated fat, so it keeps well. It's still better to store it in a dark place or at least in a can or dark bottle to stop any oxidation. Some warn against it because of the 12% of saturated fat it contains - many would now argue that this is beneficial. Home-made ‘Mayo’ tastes delicious, it’s healthier than store bought because you know exactly what goes into it and there is no need for preservatives. It will keep for up to a week in the ​fridge. When it comes to fats and oils, there are three degrees of saturation. ... although you won't find these names on the label. Importantly, the first two are much more more resistant to heating. The third group, poly-unsaturated fats deserve our attention because they can be so rich in Omega-3 and Omega-6 fatty acids which the body needs because it cannot make them itself. As a general guideline, our diets have become too rich in Omega-6 so we need to seek out as many ways of ingesting Omega-3 as possible… preferably through fresh foods rather than pills. On this message, all nutritionists agree, but that's not necessarily so when it comes to reducing Omega-6. Recent research however tells us it's important to reduce the amount of Omega-6 because of the 'inflammatory' effect it has on our bodies. We take in Omega-6 mostly through the abundant use of seed oils like corn, sunflower etc. Use cold pressed, organic versions when possible; quantities can be small so won't hit the wallet too hard and this ensures they are as fresh as possible, before being stored in a cool dark place. Whether an oil is resistant to oxidation and going rancid, at high or low heat, depends on the relative degree of saturation of the fatty acids in it. 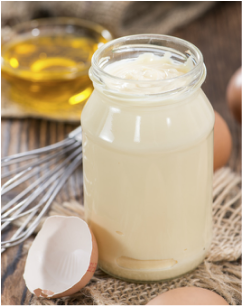 Saturated and mono-unsaturated fats are those most resistant to heat, reducing the chance of oxidation… so; this provides another important reason to limit polyunsaturated fats such as seed oils to use in mayonnaise and salad dressings. Seed oils? Not for frying please. Dietary fat, which is also a constituent of many of the foods you eat, is crucial to the absorption of fat-soluble vitamins, particularly vitamins A, D, K and E.
It’s the ability of these vitamins to dissolve in fat that allows for their absorption, moving across the cell walls of the small intestine and into the body's general circulation.The vitamins progress through the intestine, into the bloodstream and then to the liver, where they are stored until the body needs them. Without enough fat in your diet, your body cannot effectively absorb these essential fat-soluble vitamins. Dr. Fred Kummerow (who has now rteached the ripe old age of 102) analyzed the arteries and blood of patients who had undergone heart bypass operations and found elevated levels of oxidized cholesterols, called oxysterols. Much more on this at the blog. "Sat fats, having no double bonds to react with oxygen do not oxidize or form dangerous aldehydes when heated." When and where to use which fat and oil? Lard and beef dripping (tallow) - These are stable fats that do not easily go rancid and allow for cooking at higher temperatures. Grass fed animals result in fats with higher levels of Omega-3 if you can find them. Duck and goose fat - ... splendid on roast potatoes according to Gordon Ramsay (though rather high-carb! ), with a long shelf-life and providing good vitamin absorbing benefits. Coconut - This healthy, largely saturated oil is semi-solid at room temperature and lasts for months without going rancid. Try to choose virgin coconut oil. It’s organic, tastes good and has associated health benefits. Butter - Butter was demonized in the past due to its high saturated fat content but it really is healthy and nutritious. It contains Vitamins A, E and K2 and is rich in particular fatty acids which have been shown to lower body fat percentage in humans, fight inflammation, and improve gut health. Ghee - Melting it gently and separating the non-fat element makes it more suitable for cooking. The resulting ghee is a staple of much Indian cuisine and it has a usefully high smoke point of 250C while still adding a buttery taste. Olive Oil - Olive oil is well known in connection with the health benefits often associated with the Mediterranean diet. Use first-pressed Extra Virgin Olive Oil. The manufacturing process is less industrial, it tastes better and contains more nutrients and antioxidants than the refined variety. That being said, if you like to fry food in a deep fryer from time to time, it makes sense to buy the cheaper non-virgin variety. It can go rancid though so keep olive oil in a cool, dry, dark place. Palm oil - Tricky one this… Palm oil is derived from the fruit of oil palms, making a good choice for all forms of cooking. Unrefined red Palm Oil is best but there are concerns about the sustainability of harvesting palm oil, as growing the trees means less free space for indigenous animal populations. Fish oil, by the way is a great source of Omega-3 fatty acids but is generally only used as a supplement. Eating oily fish such as sardines, mackerel and salmon is considered to be heart healthy - at least one thing that all nutritionists agree upon! Flax & Rapeseed oil - Both contain lots of the plant form of Omega-3, which is good for us but the human body doesn’t easily convert this vegetable form of Omega-3 into the most active forms, which the body can digest. It is not really suitable for cooking but organic forms are a good base for salads. Olive Oil - reappearing on this side in the best and tastiest, cold-pressed extra virgin variety you can afford. Nut Oils - There are many nut oils available, most of which are used for flavouring, for example in salads. Because they are rich in polyunsaturated fats, they are not the best choice for cooking because they oxidise easily. Peanuts (actually 'legumes' not nuts) have a similar composition so the oil is also liable to oxidise at high heat. There is one nutty exception and that is macadamia nut oil; it contains mostly mono-unsaturated fats just like olive oil but in most countries, it is expensive and quite difficult to find. I know – this is the difficult bit because we’ve heard for years that these are generally better for us than lard & butter etc. But they are not. They are made in huge quantities in commercial processing plants and are very rich in Omega-6 fatty acids. Not only should you not cook with them, you should probably avoid them altogether... not that avoidance is really an option. They are ubiquitous in most processed foods and used for 'heart healthy' reasons by many chefs! They have been wrongly considered “heart-healthy” by the media and many nutrition professionals since the 1970’s but an increasing amount of research is linking these oils to a rise in certain serious diseases, including heart disease and cancer. Avoid them, unless you find artisanal versions and choose to use them as an occasional salad dressing. They include: Sunflower, Sesame, Soybean, Corn, Cottonseed, Canola (not widely sold in Europe), Grape-seed, Safflower and Rice Bran Oil. One associated problem with eating too many pre-prepared and packaged meals is that they usually contain ‘some of the above’ oils in surprisingly large quantities. Even McDonalds fries, which used to be cooked in beef tallow, are now fried in a canola and/or sunflower oil blend. The switch was made rather ironically yet again, for health reasons! 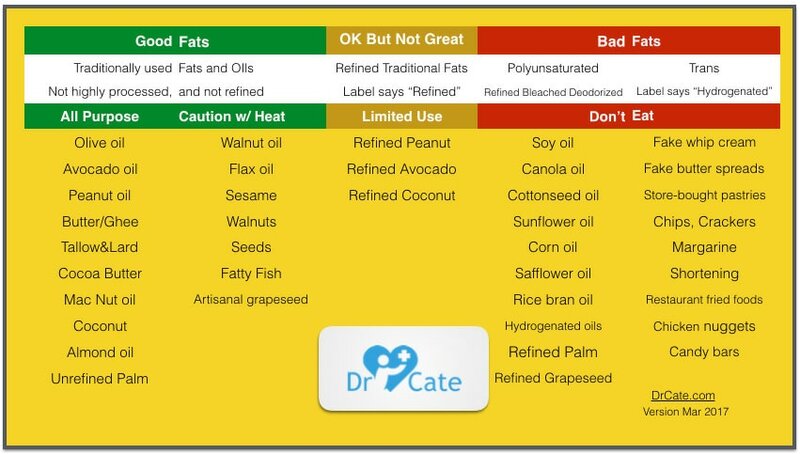 Dr Cate Shanahan's guide to better fats.